Are you in the Oslo area around May 4th? Then there is no reason not to stop by DogA (Norwegian Design and Architecture Centre) in downtown Oslo where this year’s Vegetarian Festival is arranged. Here you can experience a delicious variety of foods, lectures, cooking classes, food samples and much more. Oslo Vegetarian Festival was first arranged in 2010 by Heidi Røneid and Synne Hewitt. Their aim was to create a festival where vegetarians could meet and try new products, eat great food, participate in inspiring cooking classes and lectures or buy delicious vegetarian food. 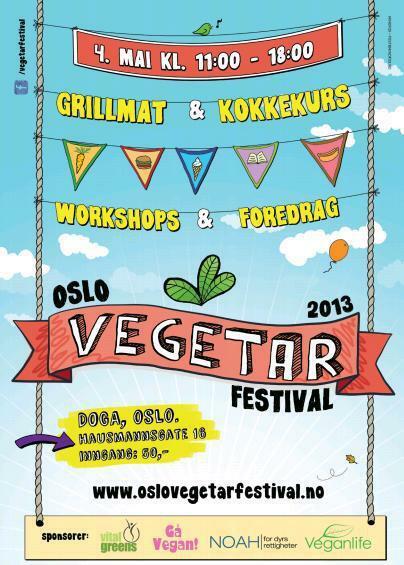 The festival also wants to educate non-vegetarians about a healthy life without meat. The lectures and cooking courses last for 45 minutes, and between each lecture there is 15 minutes break. There is limited space on the cooking courses, but the lectures have great capacity. These events are held in Norwegian. Anamma: Swedish manufacturer of vegetarian products. Bio Vann og Helse: Organic cooking oils, protein powder, organic coconut bars, nutritional supplements (including liquid vitamin B12) and food samples. Carina Hultin Dahlmann og juicydrops: Meet author and juice therapist Carina Hultin Dahlmann and get a taste her freshly squeezed juices. Charlottes Urtekosmetikk: Vegan skin and hair products, handmade in Asker outside Oslo, based on wild and organic herbs. Det lille kakehuset av Veganista og Veganmannen: Lovely vegan cakes, cupcakes, cookies and candy. Epleslang Eplemost: Tasty apple juice from “a neighbor’s garden”. Come and hear the whole story! Forever Living: Independent distributor Gro Dagestad is offering organic Aloe Vera skin care products and nutritional supplements, with a 90-day satisfaction guarantee. Fragrance of the Heart Café: Cafe with vegan and gluten-free products. Framtiden i våre hender: Norway’s largest environmental organization who works for a fair distribution of the world’s resources. Fremtidens mat: Online store retailer of edible seaweed from the North Atlantic. Fria Bröd: Food samples of new vegan and gluten-free pizza. Friends Fair Trade: Offers ethical vegan products. Funky Fresh Foods: The leading manufacturer of raw food. Green Nutrition: Supplier of organic supplements. Gå Vegan: Vegan catering and vegan food products. Hannas Grill and Juice Bar: Hanna will show you how to make homemade sausages. Heidis Hummus: Selling hummus and vegan aioli. Krishna’s Cuisine: Vegan casseroles, salad, papadums, pakora, juice and pastries. Le Palais des Thes: Tea specialists – tasting world culture. Mere Suppe: – Healthy, authentic and tasty soups full of good nutrients, without additives. Miljøpartiet de Grønne: Political environmental party giving information on health friendly, animal-friendly and climate-friendly policies, and cake sales! NOAH – for dyrs rettigheter: Organization working for animal rights and veganism. Norsk Vegansamfunn: Norwegian Vegan Society working to promote veganism as an ethical way of life for the sake of humans, animals and the environment. Norsk Vegetarforening: Positive, inclusive information about vegetarianism and veganism, with books, courses and information. Opplands Sitron-stand: Real lemonade from Oppland County. Oslo Grønn Ungdom: The Environmental Party’s youth organization working for a caring society in ecological balance. Oslo Venstre: Oslo Liberal Party marks the day by saying no to fur. Raw food Tapas & Mezze Bar: Chefs Pablo Castellanos and Naser Sabetzadeh are focuses on the processes “from food to table”, and the food’s effect on the body, mind, soul and on Earth. Robs Rå Racermat: Lifestyle & Health, a natural recipe for a good and happy life. Solgård Levert: Fresh, organic fruit and vegetables delivered to your home or workplace. Sunkost Gunerius: Linda McCartney, Amy’s Kitchen, Fry’s and much more delicious vegan products. Sunnhetsbladet: Health magazine – serious about vegetarian cooking since 1881. Veganlife: Scandinavia’s largest vegan shop with vegan food, dietary supplements, sweets, cleaning products and much more. Vegetarbloggen: Vegetarian blog selling extravagant, vegan cupcakes. Veggisbutikken: Vegetarian shop offering vegan and vegetarian shoes, food, kitchen and garden utensils. Vin og grønt: Delicious Mediterranean cuisine, vegetables, legumes and pizza fritters. Waffle Hut: Organic, delicious vegan waffles. Yerba Mate Norge: Yerba Mate is refreshing and naturally rich in antioxidants, vitamins and minerals. Øko Hjertet: Organic grocery store located at Hovseter in Oslo with home delivery of organic fruit and vegetables. Økosjokolade: Organic and Fairtrade products to make delicious homemade chocolate! I am interested in helping people live healthier lives and also looking to expand my business internationally by bringing people onto my team and showing them how they can help impact the lives of others as well. I look forward to hearing from anyone who might want more information.